Vector-generated image comparing a foot with (left) and without (right) Morton's toe. The dotted curve indicates the joint position. A Morton’s toe otherwise called Morton's foot or Greek foot or Royal toe, is characterized by a longer second toe. This is because the first metatarsal, behind the big toe, is short compared to the second metatarsal, next to it. 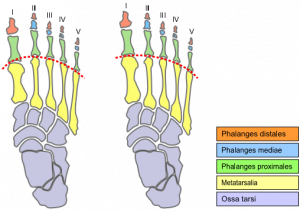 The longer second metatarsal puts the joint at the base of the second toe (the second metatarsophalangeal or MTP joint) further forward. It is a type of brachymetatarsia. Morton's toe is a little misleading, because this condition is not really a long toe, meaning the phalanges (toe bones). It is the relative length of the metatarsal foot bones, specifically the relative length difference between the first and second that defines this foot shape. X-ray image of a patient with Morton's toe. The name derives from American orthopedic surgeon Dudley Joy Morton (1884–1960) who originally described it as part of Morton's triad (a.k.a. Morton's syndrome or Morton's foot syndrome) a congenital short first metatarsal bone, a hypermobile first metatarsal segment, and calluses under the second and third metatarsals. Tachdjian reported that first metatarsal is the most commonly affected metatarsal, although the incidence was found to be 1 in 10,000, whereas a majority of other podiatric and orthopaedic authors claim the fourth brachymetatarsia to be the most common. There is a strong female to male predisposition in the majority of the podiatric and orthopedic literature. The average ratio is 25:1 and the majority of the population studied is between the ages of 5 and 14 years of age. The aetiology of Morton's toe can be associated with idiopathic congenital conditions and acquired disorders. Idiopathic congenital conditions can include such conditions as hereditary early epiphyseal plate closure, associated congenital disorders such as Down’s, Turner’s, Larsen’s, Albright’s syndromes, pseudohypoparathyroidism, poliomyelitis, dystrophic dysplasia, pseudohyperparathyroidism, multiple epiphyseal dysplasia and myositis ossificans. Acquired disorders can include trauma, neurotrophic disorder, radiation exposure, surgical resection of metatarsal head, infection, or osteochondrosis. Morton’s toe can thus present with one or both of two problems that can affect the first metatarsal bone. 1. First metatarsal bone that is shorter than the second metatarsal bone. 2. Hypermobility or instability of the First Metatarsal Bone. These in turn affects the normal walking process and places pressure on the second metatarsal during the toe-off phase. Pronation is the single most important term used in the discussion of how the foot works. The most common reason for people to have foot problems is due to an abnormal amount of Pronation. Morton’s Toe will cause an individual to have abnormal or over pronation. It is this pronation that is the ultimate cause or contributing factor to most of the problems not only of the foot but also of the whole body. Pronation is a series of movements the foot must make in order for us to walk properly. But, it is not that simply. Normal Pronation is a series of motions the foot must have, so that it can absorb the shock of meeting the ground. It must be able to do this, in order to adapt and adjust to the new walking surfaces it has just met. This adjustment should only last a fraction of a second to allow the foot to slow down; absorb the shock of your body weight in order to adjust and adapt to the walking surface. At this point in time normal pronation is taking place and the foot is referred to as a “bag of bones” due to its ability to adapt to the new walking or running surfaces. Part of this process of becoming a “bag of bones” is that the arch will start to flatten out and roll toward the ground. Normal pronation should only last no longer than a moment for the foot to adjust. If this adjustments last longer then the foot will begin to abnormally pronate and to correct itself. This is the start of a “chain reaction” that puts the foot under a lot of abnormal stress and strain, causing Bunions, Heel Spurs Plantar Fasciitis, Corns, Callouses, Ingrown Toenail and numerous other foot problems. Over or abnormal pronation occurs when the foot is still pronating when it shouldn’t be. Once the foot has adapted to the ground the foot should stop pronating and should be starting to stabilizing itself or locking itself. This locking is called Supination and is the opposite of Pronation. Supination must take place so the foot can become a “Rigid Lever*” (opposite of “bag of bones”) in order for it to support our body when we push off from the ground; and propel us forward for our next step. In Supination the arch of the foot goes up (instead of down as in Pronation) so that it can become the Ridge Lever. But, if you are Over Pronating and you still are a “Bag of Bones and not the Rigid Lever when pushing off from the ground, then your foot and body will attempt to stop the over pronation by compensation. This compensation puts the bones, muscles, tendons, ligaments, and other structures under a tremendous amount of abnormal stress and strain not only of the foot but of the whole body. It is this abnormal stress caused by the body attempting to compensate that is the start of most of our feet and body wide problems. A short first metatarsal bone, and or hypermobility of the first metatarsal bone can lead to a lack of proper stabilization on the fore foot, at the critical moment when the foot must be a “ridge lever” in order for it to push off from the ground. This instability will force the foot to compensate in its attempt to become that “ridge lever”. There are a variety of treatments available for conservative treatment and surgical correction of Morton's toe. Foot surgery is a last resort, not first aid. 1. Orthotic devices: Orthotics that feature arch support to keep the foot aligned, and a metatarsal pad to reduce stress on the ball-of-the-foot are often recommended when treating this condition. 2. Metatarsal pads: The basic, simple treatment for Morton’s Toe and most of the problems associated with it, such as back pain, knee pain, hip pain, fibromyalgia, arthritis and most foot pains, is with a pad that is applied to the bottom of your first metatarsal bone that we call the “Toe Pad.” It was first written about by Dr. Morton in 1927. 3. Wide toe-box shoe gear: Proper treatment of Morton's Toe starts with selecting proper footwear. Footwear with a high and wide toe box (toe area) is ideal for treating this condition. It may be necessary to buy footwear a half size to a size larger to accommodate the longer second toe. Proper footwear combined with a effective orthotic will provide relief from pain associated with Morton's Toe. Taping can also be used to reduce the hypermobility and strengthen the transverse arch of the foot. 1. Metatarsal heads 2-4 resection. 2. Proximal ostectomy of metatarsals 2-4, followed by (Teflon prosthesis) implant arthroplasty in first metatarsal. 3. Chiappara procedure: First proximal phalanx shortening, combined with shortening of proximal aspect of metatarsals 2, 3, 4 and lengthening medial cuneiform – allowing hallucal interphalangeal joint (IPJ) to compensate for first metatarsophalangeal (MTP) joint. ↑ 1.0 1.1 1.2 1.3 Schimizzi, A; Brage, M (September 2004). "Brachymetatarsia". Foot Ankle Clin 9 (3): 555–70, doi:10.1016/j.fcl.2004.05.002. PMID 15324790. ↑ 2.0 2.1 2.2 Mendeszoon MJ; Kaplan YL; Crockett RS; Cunningham N (2009). Congenital Bilateral First Brachymetatarsia: A Case Report and Review of Available Conservative and Surgical Treatment Options. The foot and Ankle Journal 2 (9): 1. ↑ 3.0 3.1 3.2 Morton's Toe. http://www.mortonstoe.com/ [last accessed 27/6/2018]. ↑ Morton's syndrome (Dudley Joy Morton) at Who Named It? ↑ Tachdjian MO: “Disorders of the foot” in Tachdjian’s Pediatric Orthopaedics. Ed by JA Herring JA, WB Saunders, Philadelphia, 1990. ↑ Bartolomei FJ: Surgical correction of Brachymetatarsia. J Am Podiatr Med Assoc 80 (2): 76 – 82, 1990. ↑ Goforth WP, Overbeek TD: Brachymetatarsia of the third and fourth metatarsals. J Am Podiatr Med Assoc 91: 373 – 378, 2001. 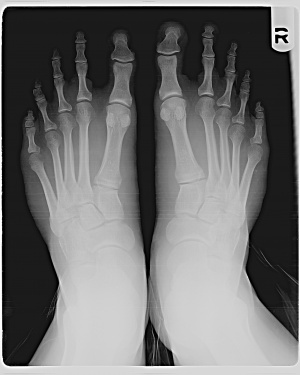 ↑ Munuera Martínez PV, Lafuente Sotillos G, Domínguez Maldonado G, Salcini Macías JL, Martínez Camuña L: Morphofunctional study of Brachymetatarsia of the fourth metatarsal. J Am Podiatr Med Assoc 94: 347 – 352, 2004. ↑ 9.0 9.1 9.2 9.3 9.4 9.5 9.6 9.7 9.8 Burton Schuler. Foot Care for You. http://www.footcare4u.com/mortons-toe-what-is-it-what-causes-it-how-to-treat-it/ [last accessed 27/6/2018]. ↑ How to deal with Morton's Toe. http://www.wikihow.com/Deal-With-Morton's-Toe [last accessed 27 June 2018]. ↑ 12.0 12.1 Steedman JT, Peterson HA: Brachymetatarsia of the first metatarsal treated by surgical lengthening. J Pediatr Orthop 12 (6): 780 – 785, 1992. ↑ Chiappara P: Utilisation de la dure-mére dans la chirurgie de l’avant-pied rhumatoide. Mèd Chir Pied 7, 197 – 198, 1991.